Tinson Training offers Electrical Training courses that can be designed to match your exact needs. The courses listed are generic examples of what can be provided and will be adjusted to meet your precise needs. Just call or email to start the discussion. The courses will cover all the essential equipment, tools and systems that will be encountered in the real environment. 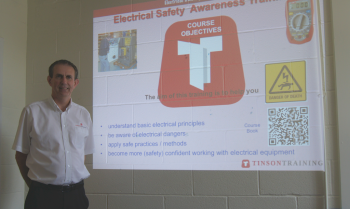 Click here to download a catalogue of typical courses on offer from Tinson Training. These are delivered on your site wherever that is in the UK and will focus on the equipment you use so that the training has maximum relevance for the attendees. The Electrical Maintenance Training Course is ideal for people who need to carry out maintenance activities on electrical equipment who have no electrical qualifications. This course is designed with the Maintenance and Service Engineer in mind, and will focus on typical faults and problems in industrial electrical control systems. Electrical Isolation training is aimed at any person who has the responsibility for the isolation of electrical supplies whether it be for electrical or non electrical work. The Office Electrical Awareness course is designed for office staff. It is ideal for anyone in the office that has any responsibility for ensuring that electrical equipment is kept in a safe condition.